While not expecting the doldrums, we were given to expect mildly better then we got. Oh that stiff nagging breeze across the Trossachs! Did we get the hump? nah, defiance kicks in and off we go. Saturday started with a hint of drizzle but breezy or not I was dying to try the new flying coffin (F-104). I know it's impossible but there lies the attraction. Out of the flying case it exhibited a vicious snap roll to the right. Blu-tac turbulator on left wing trailing edge evened things up but all was still chaos at launch. Nose weight, then more and more in small increments. Breeze didn't help me one bit but it's ready for power. An L-2X hung in the belly pod and lighting up brought complete anarchy to the skies. It's as impossible as it's big brother, however, I found a gentler launch brought dividends to around 50 feet where all hell broke loose in a totally unpredictable fashion. I must confess I flew it more on Sunday when I bought more motors. Entertaining, you bet, it can do more aerobatics in 20 seconds than the red arrows can do in a half hour. It glides like........ a shovel, no that's too harsh, it's not vertical but steep. Sunday was the better of the two days and in a calm spell I even flew the beautiful DH 108 but due to the perceived extra thrust -L2LT's, I added some extra nose weight and it was a joy to behold. Above: AB's squadron - note DH108. His Ewd Arrows Hawk flew well. Pity about the Delta Dart! Roger, Chris, Andy Sephton, John Emmet, David Potts and Tony Butter worth were all producing smoke and the family Digby joined in the fun on Sunday for a R apier fest. Andy's DH110 Sea Vixen had the flight of the weekend when it did a "deck landing" on one of the stalls in the ca rpark, funny but not on video. John and Mark Digby did quite a bit of filming which should be killer. I must confess I've had a sore throat, aching bones and muscles and have felt rather ill all weekend but I hope I disguised it well enough to not spoil anyone's enjoyment. Many thanks Andy. We had a great time and your Red Arrow's Hawk flew a treat. Above: Chris with rescued-from trees Rocket Boy and 'Something Else'. Flew well. Above: CR, RJS and AB on the blustery Saturday. Above: my F-100 flew splendidly after some trimming. Above: John Emmet with Vipers. 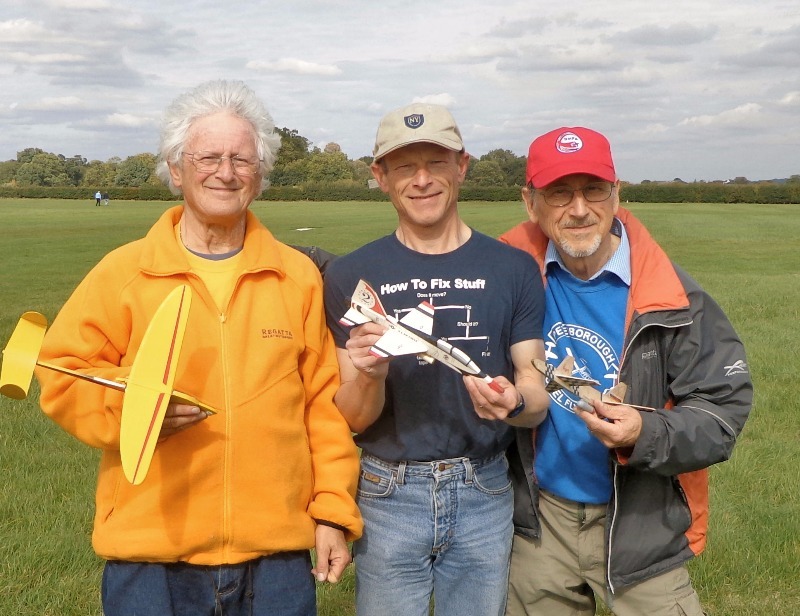 They flew well (Tony Butterworth had one slso) in the unpredictable conditions. Above: Alan Price with is lovely L-1 powered F-4 Phantom. 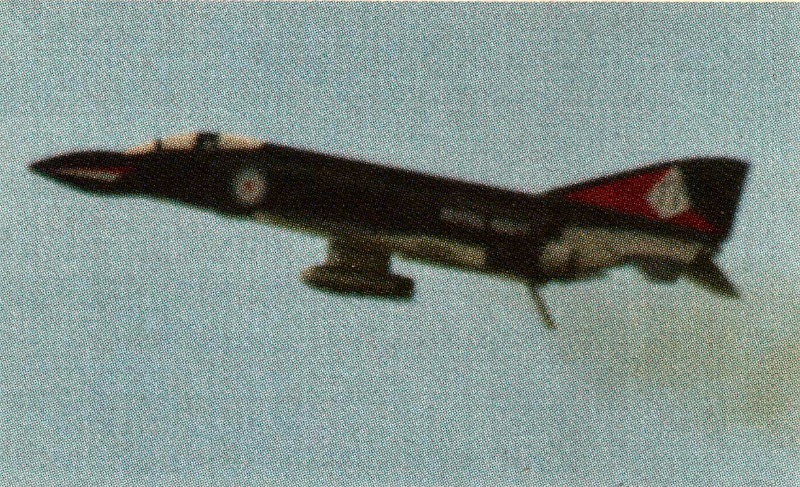 Above: Alan's F-4 in Flight. I (Roger) will long remember Andy's F-104. 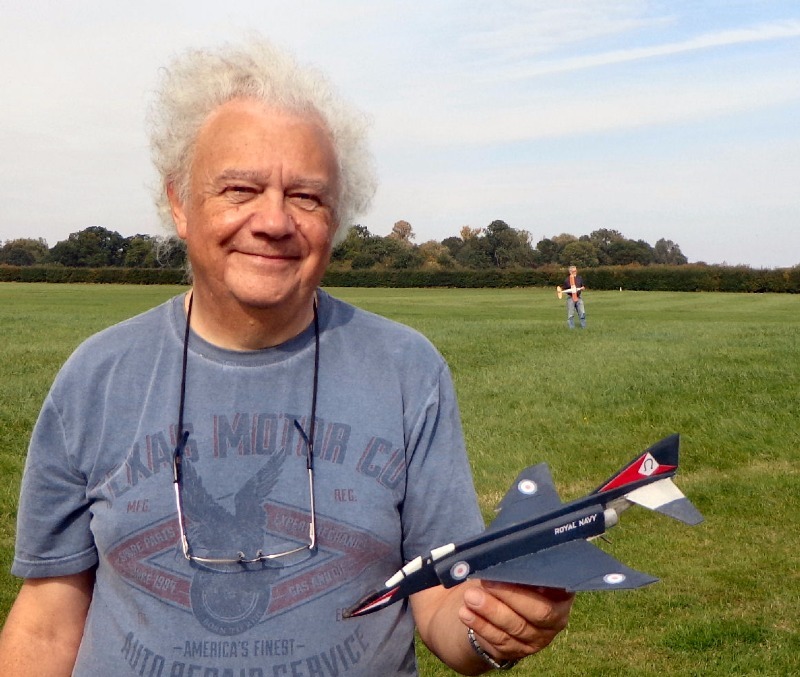 Mark Digby's Gripen, the Viper's, my F-100s, the Draken, launched into sink (stupid boy!) cruising around at 19 ft or so without crashing, Andy's DH 108. So, to sum up: we had a good time despite the conditions - wind, gusts, lift, sink, errant motors, dead igniters ... Andy's dad (90+) said he'd 'had a lovely time' and went home well content. 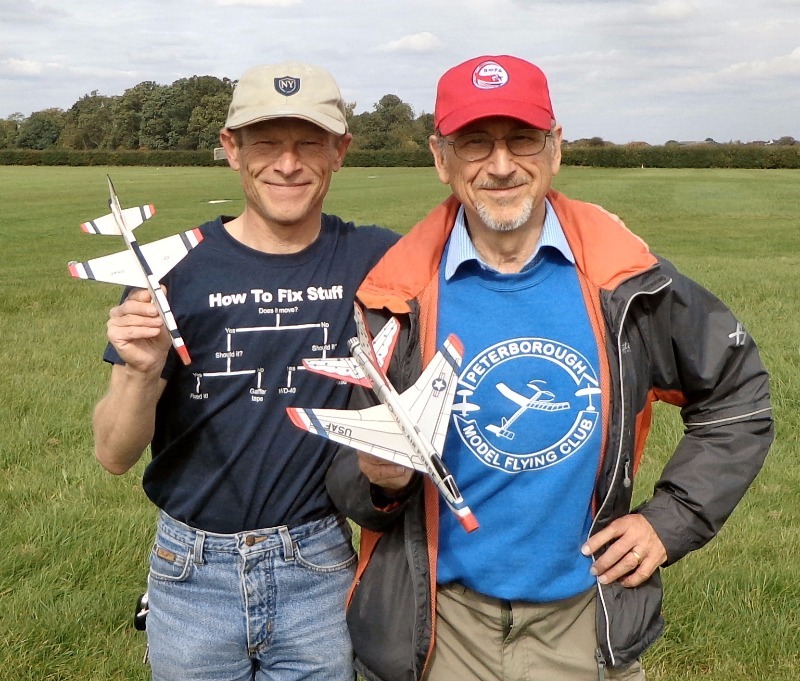 Thanks for posting, I am so glad you guys managed to do some flying despite the forecast and had fun, sorry I couldn't join you, next time hopefully. The colourful Phantom looks great too. Many thanks Mark and John. Some outstanding flights here in very tricky conditions. 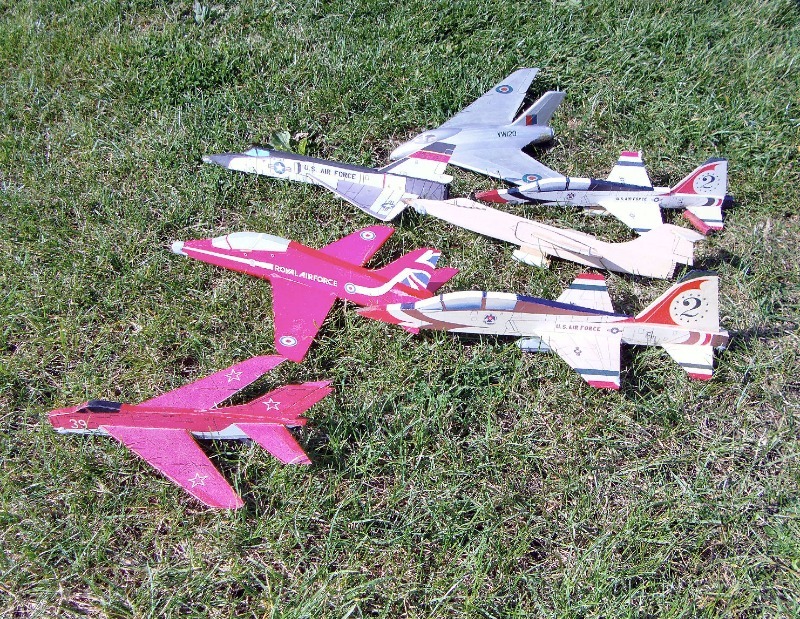 Glad you captured the flights of Andy's T-38 and F-104 Starfighter. 'Stable cruises' around the field these were not - very entertaining. I loved the two DH 110 Sea Vixens which can be tricky to fly in the built up versions. My Cutlass was caught out by too-powerful a motor but the Wren looked good even with the latest powerful L-1s. Mark's Gripen was outstanding - I can't wait for the plan! Oooow loved the video, many thanks for posting, some of the flights were fantastic. Watching it reminded me that there are many ways of skinning the cat, the cat in this case is getting our beloved Rapier models to perform decently and stay in the air as long as possible rather than ending up stuck in the ground. Recently I wrote that under slung motors could benefit from a down thrust tab, but from the video it is obvious that this is not the only way to go. Derek Knight I noticed had super flights with his silver profile DH110 climbing to the right in a nice spiral then going to the left on the glide. 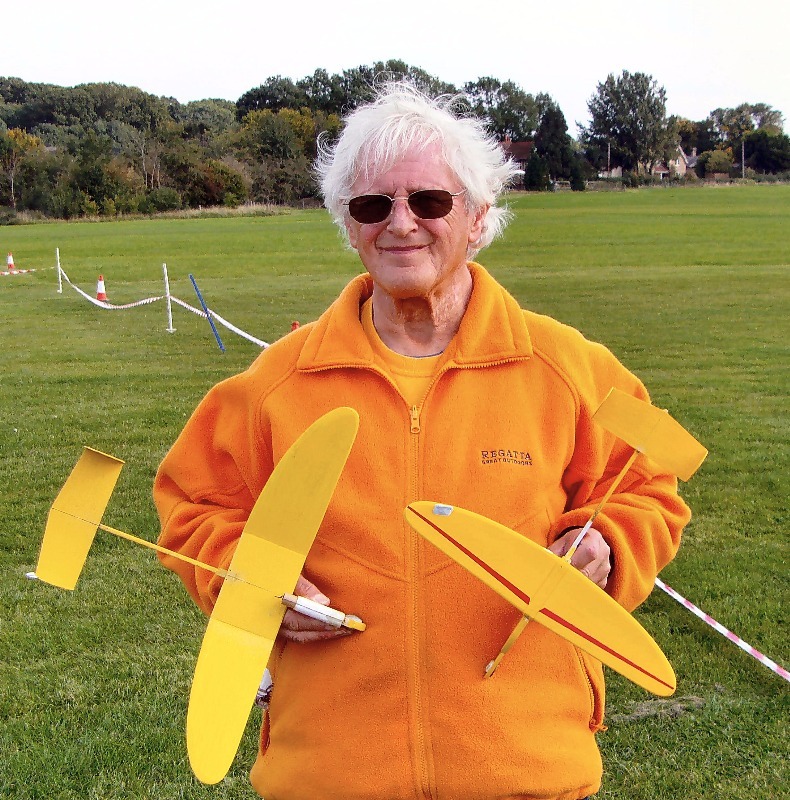 Presumably he has achieved this with a very slightly offset motor to give a right turn under power and a slight tweak on the model somewhere to give a left turn in the glide. The tweak could be a touch of left rudder or weight on the left wing or extra washout on the left wing, these would also help stop the right turn under power getting out of hand. I managed this quite by accident with my foam T38 and the height gain was spectacular, I should have learnt from that there and then. 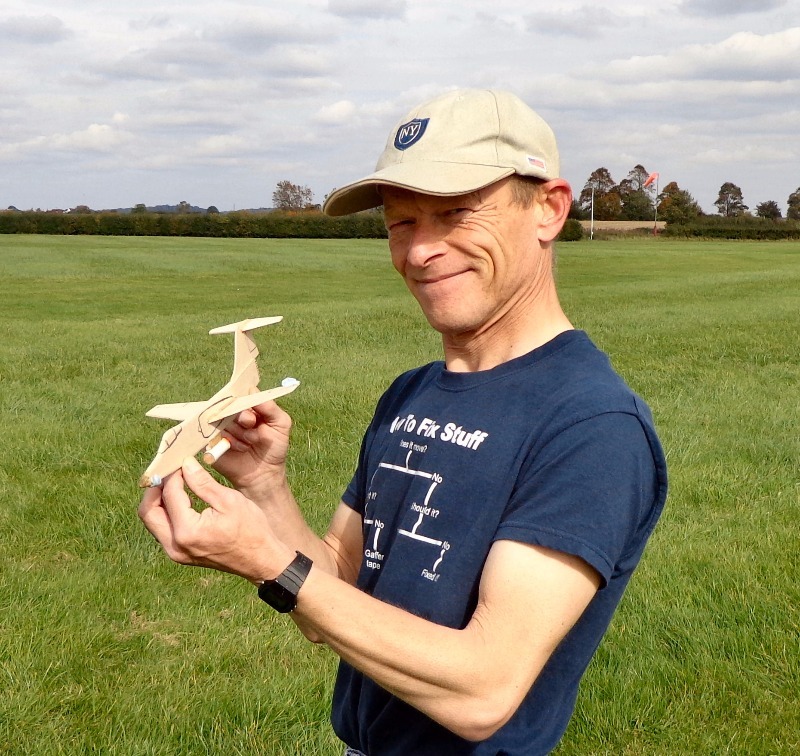 Andy Blackwell on the other hand has a Starfighter and a T38 Talon that half roll back upright at the top of a half loop thanks to the weight of the Rapier underneath which it then repeats and continues back on upwards. I had found that this happened readily with my profile Harrier (with full anhedral) when it had a Jetex 50 underneath but not so readily when the Jetex was replaced by a Rapier. My conclusion is that if I added some weight to the model somewhere on the Rapier mount to equal the weight of the Jetex 50 then this neat little trick would have been restored and maybe the model does not need a down thrust tab at all, and maybe I can do the same with my profile Starfighter. Got to try it!! Thanks Mark and John for the super footage. I remember thinking, "I hope they got that in the can" type of thing. It's just as fun as I remember, the f104 was crazy. I didn't realise it would be quite so frantic, but let's take our hat off to Mark for capturing some difficult action in a professional manner. It's slick presentation also works well without cheesy intro music or distractions, the format looks good. I noticed when I ran the larger size t38 at P'boro that it didn't do the half loop trick. There is something about the size of model plus quite powerful L2 that makes this happy coincidence occur. Of course there are other factors also at work such as motor position and depth of motor pylon, weight distribution, attack angles, wing loading. To tell the truth it's amazing we got any worthwhile flights at all in that breeze. More than once I spotted some breeze induced dutch roll over the entire weeked. Not only that but I also saw quite a few flights dive-bomb the flight line too, any thoughts on that? OK Andy I'll stick my neck out, here are a couple of possible causes based on experience rather than theory. My first guess is that the model is too nose heavy giving at best a poor glide and at worst no recovery once in a dive, however that is induced. I found out years ago when flying R/C models that if the model was nose heavy it would drop its nose in a steeply banked turn and if it was tail heavy the reverse would happen. When we fly our Rapier models in the wind we often add extra nose weight to stabilize them and when they tend to loop there is a tendency to do the same. Adding nose weight for both these reasons can lead to the deadly nose dive as the model effectively has insufficient decalage for stability (see the next para below). The solution is to rebalance the model to give a nice glide and use a down thrust tab, or opposite side thrust and turn offsets or extra heavy motor mount to get a lower CG. 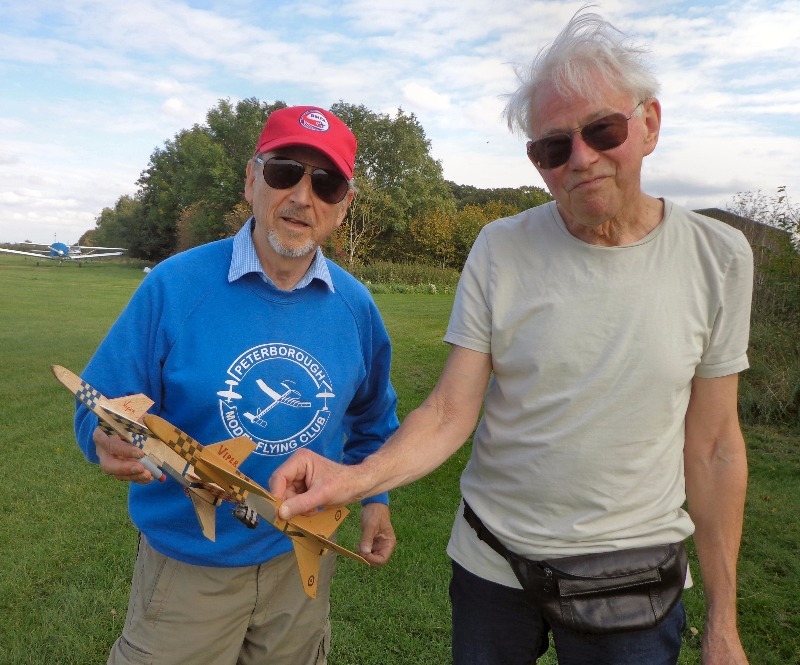 The danger here of course is that the model will now fly well outside the Old Warden boundaries. There is another possibility and that is too little decalage designed into the model, which I found was a problem on my Mig29 from the Aeromodeller plan as this had zero decalage! It used to fly very nicely if it was flat calm but if it hit any turbulence having gained some height it would roll over and dive almost vertically to the ground. After numerous repairs trying to fly it as per plan I finally resolved it by adding some negative incidence to the tailplane and rebalancing it. It flies reliably and well now.